Sometimes you find a webapp on the intertubes that's so useful you'd be charged for criminally negligent conduct if you didn't tell other people about it. As far as I understand it. In this case it's Texterity's FreeSVG service which takes PDFs you upload, breaks them down into their individual components (including text, images, fonts and vector drawings), converts it all into an SVG file, bundles all the material into a zip file, then emails you a 48 hour link to fetch it. Very, very nice. 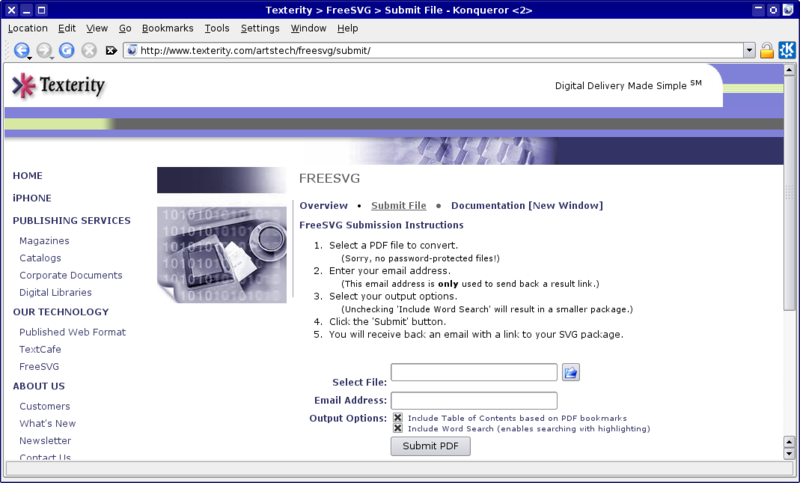 FreeSVG is provided by Texterity to encourage the use of SVG (Scalable Vector Graphics) on the web and enable free, highly functional conversion of PDF documents into fully accessible and navigable SVG. SVG is an industry standard, W3C (World Wide Web Consortium) specification describing text and graphics in XML. To learn more about SVG visit the W3C site at http://www.w3.org/Graphics/SVG/. Now obviously for security reasons you'd definitely not want to use this service for confidential or sensitive information, but for general use it's a fantastic solution, and has saved my arse many times! Newer post ← Dodgy Windows virus scanner on FreeBSD!